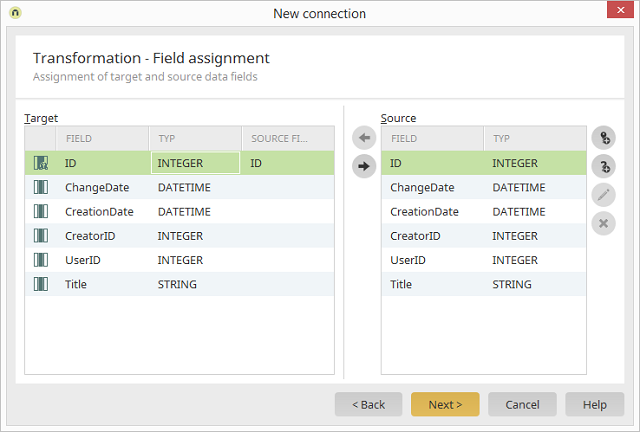 Integration module Data transfer / Create new connection Any settings, Click on "Next"
Highlight the target data field to which a source data field should be assigned. Highlight the source data field that should be assigned to a target data field. The assignment of the highlighted fields is created or removed, respectively. Opens a dialog where an autovalue can be created. If the data source is a child data group, a dialog will open here where the key for the assignment of child data records to a data record of the parent data group can be defined. For JDBC targets, the same button opens a dialog where the target query can be defined. Opens a dialog where the target query can be edited.